Though a minor figure among poets of Dante’s circle, Immanuel of Rome presents a unique case that enriches our understanding of Dante’s multicultural environs, a topic to which scholars have begun to devote significant attention (See Barolini, “Dante’s Sympathy for the Other”; see also Dante and Islam, ed. Ziolkowski). In addition to being the first poet to write a sonnet in a language other than Italian (in this case Hebrew), Immanuel is the only Jewish poet whose thirteenth- early-fourteenth-century Italian lyrics are extant, surviving in six manuscripts. We know frustratingly little about Immanuel’s life; much of the biographical information that has been accepted as fact originated in Immanuel’s fictional writings. He was born in Rome in 1261 and lived until roughly 1335, fourteen years after Dante’s death. He acted as head of correspondence for the Jewish community of Rome and might have held a more permanent high post in the Jewish community. He likely left Rome in 1321, perhaps in response to the 1321 papal edict to expel the Jews from Rome, though there is little evidence regarding the extent to which the Church enforced the edict. Scholars suppose that Immanuel moved among Perugia, Fabriano, Fermo, Camerino, Ancona, Gubbio, and Verona, having gleaned this itinerary from Immanuel’s fictional writings. Gubbio is a plausible location, given Immanuel’s tenzone with Bosone da Gubbio and because he is referred to as “Manuel Giudeo da Gobio” in the Vat. Barb. Lat. 3953, folio 128. Immanuel is best known for his Maḥbarot Immanuel, a Hebrew-language collection of stories in rhymed prose and poetry often referred to as a maqāma (Ar. pl. maqāmāt; Hebraized pl. maqamot; Hebrew equivalent maḥberet, pl. maḥbarot), a prosimetric genre that first appeared in Arabic in the tenth century in the region known today as northeastern Iran. After gaining traction in Arabic literary circles as a scholarly and didactic genre, the maqama was adopted for use in Hebrew in Christian Spain during the first part of the twelfth century. Though it is highly unlikely that Immanuel knew Arabic, he was certainly familiar with the Hebrew maqama arriving from Spain, particularly with Judah al-Ḥarizi’s Ṭahkemoni, the Hebrew maqama that most clearly adheres to the form of the canonical Arabic maqama and to which Immanuel refers in his introduction to the Maḥbarot Immanuel. Aside from the Maḥbarot Immanuel, Immanuel also wrote: a treatise in Hebrew on the symbolism of the Hebrew alphabet (not extant); a hermeneutic work in Hebrew entitled Even Boḥan (Examination of Stone); Hebrew commentaries on nearly the entire Bible; a philosophical epistle in Hebrew to philosopher, physician, and biblical exegete Hillel ben Samuel of Verona; and five poems in vernacular Italian (four sonnets and one frottola). The formal aspect of Tofet ve-ʿeden that truly sets it apart from the other stories in the Maḥbarot is its rhymed prose structure that lacks interspersed rhymed metered poems, a formal feature present in all other stories in his collection and customary in all Arabic and Hebrew maqamas. Although to the modern reader rhymed prose might seem to fall somewhere between the categories of poetry and prose, it was technically a variety of prose in classical Arabic and medieval Hebrew, generally reserved for writing that required eloquence, such as formal epistles. As ornate prose, it is not easily comparable to Dante’s terza rima, even though maqama authors prided themselves on achieving compositional virtuosity. In fact, other stories in Immanuel’s collection, such as the 20th mahberet, are more attuned to poetic achievement than its final installment. Tofet ve-ʿeden thus seems to be more of an experiment in thematic rather than poetic emulation of the Divine Comedy for Immanuel’s Jewish readers. Before taking a closer look at Immanuel’s Hebrew sonnets, I pause to explain the nature Immanuel’s Hebrew writing. Hebrew was not a spoken language at this time; Immanuel’s Hebrew writing follows in the tradition of Andalusian Jews who, in the Golden Age of Hebrew letters (ca. 950-1150), spoke Arabic, wrote poetry in biblical Hebrew, and wrote philosophical, medical, scientific, grammatical, literary, and mathematical treatises in Judeo-Arabic (i.e., Arabic in Hebrew letters). By Immanuel’s time, grim realities had pushed Jews out of Southern Spain to Northern Spain (though not hospitable for long), Southern France, Italy, North Africa, and elsewhere. 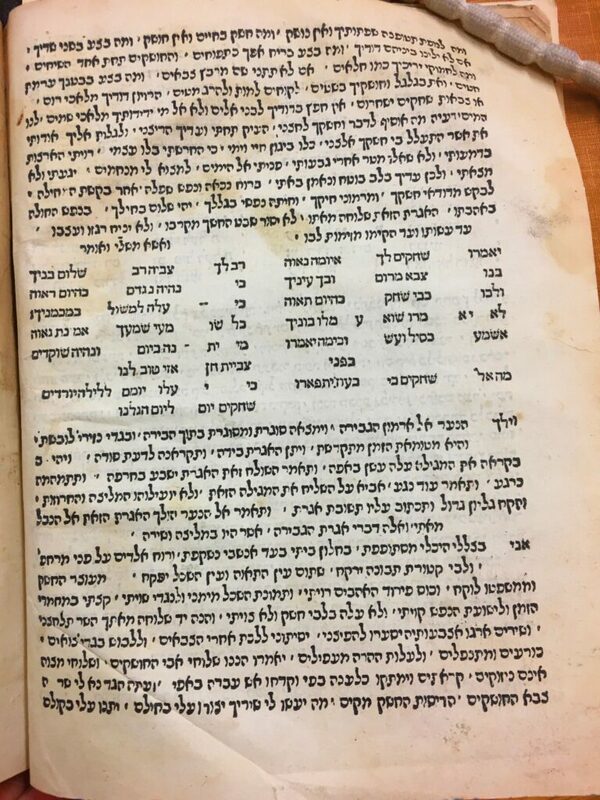 Learned Andalusian Jews brought scholarly works with them and translated them from Arabic and Judeo-Arabic into Hebrew to reach non-Arabic readers. Though we have no evidence whatsoever that Immanuel’s family came from Iberia (Jews were established in Rome as early as 139 BCE; Stern, “Roman Literature,” Encyclopedia Judaica), Immanuel’s generation of Roman Jews studied and embraced Andalusi intellectualism via its Hebrew translations. Thus, when writing in Hebrew, Immanuel, like his Andalusian predecessors, relied on biblical Hebrew and was well aware of philosophical translations and commentaries. This multilingual scenario carries with it significant hermeneutic implications. 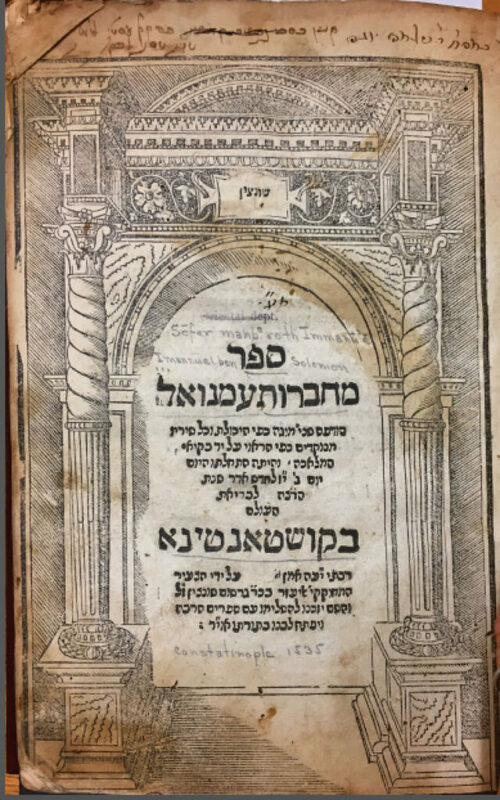 Immanuel’s Maḥbarot Immanuel boasts thirty-eight Hebrew sonnets, making it the first language to claim a sonnet in its repertoire following the form’s invention in Italian. To compose a sonnet in Hebrew, Immanuel forged what Dvora Bregman describes as a new kind of “quantitative-syllabic” meter that combined elements of both Hebrew (via Arabic) quantitative meter and Italian syllabic meter (Bregman, The Golden Way, trans. Brener, p. 32). Secular and liturgical Hebrew poetry composed in Islamic Spain and later in Christian Spain was based on a quantitative metrical system that Jewish poets in tenth-century al-Andalus adopted from Arabic poetry, though it is not a natural fit for Hebrew verse (Weiss, et. 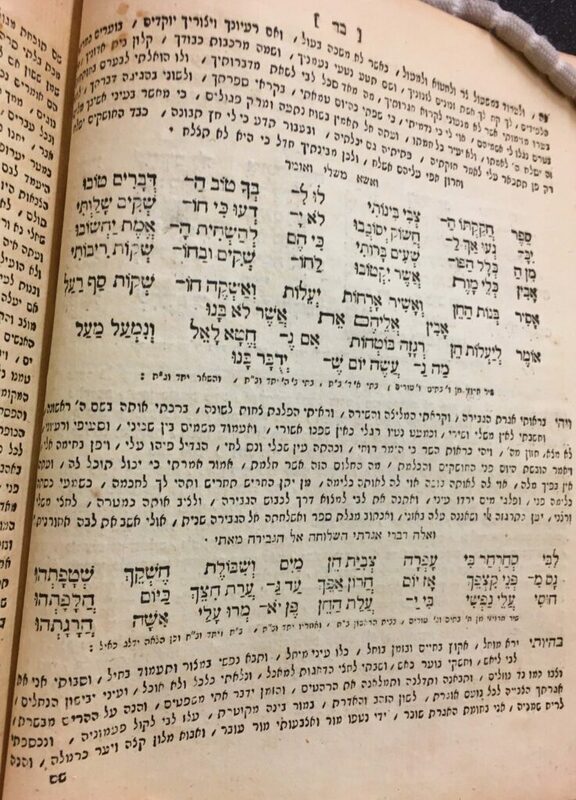 al., “Poetry,” Encyclopedia Judaica). After initial objections to the use of Arabic poetics in secular, and subsequently liturgical, Hebrew compositions, the use of Arabic quantitative meter became the convention for Jewish poets across the medieval Mediterranean, such that Immanuel utilized this system without even knowing Arabic. Immanuel’s ability to “translate” the form of the sonnet into Hebrew—all while maintaining medieval Hebrew poetry’s convention of quantitative meter—demonstrates his keen familiarity with compositional techniques in vernacular Italian. Beyond formal characteristics, Immanuel’s Hebrew sonnets likewise reveal his deep understanding of the thematic and linguistic components of the early-fourteenth-century sonnet. An instance of Immanuel’s adaptation of a stilnovist-themed sonnet from Italian to Hebrew appears in the third maḥberet (story) of his Maḥbarot Immanuel, a story that in most manuscripts and print editions of the text is titled megilat ha-ḥesheq (The Scroll of Love). In the story, Immanuel as narrator and protagonist describes what ensues when his patron goads him into courting a beautiful nun. In the courting process, Immanuel and the nun exchange ten poems, four of them sonnets—more sonnets than in any other story of the collection. oya leyearḥ ziv asher nehpakh levul! ʿal ʿash u-maʿlata, asher bo shafela. ʿal tsuf ve-yaʿrat ha-devash hitgabera! Upon the bare earth buds wither and moan. For the glorious star now dethroned. How wondrous is Death, bound to this star. And thy sweetness, that exceeds nectar by far! The first tercet of Immanuel’s sonnet, like these verses from Dante’s canzone, admits jealousy of anthropomorphized Death, who has held the poet’s lady closer than the poet himself. The real possibility that Immanuel saw the Vita Nuova in manuscript form could explain this near translation of Italian to Hebrew (Castellani, “Sul codice Laurenziano Martelliano 12”; Roth, “New Light on Dante’s Circle,” 28; thanks to Teodolinda Barolini, Wayne Storey, and Martin Eisner for their input into the question of transmission of the Vita Nuova, via email, October 2012). Yet Immanuel was not merely copying and translating; he clearly understood vernacular Italian lyrics well enough to formulate them in Hebrew both structurally (in this case moving from canzone to sonnet and composing the sonnet to adhere to quantitative and syllabic meters) and thematically (representing anthropomorphized Death and divine jealousy of the beloved, for instance). Further, he works this poem seamlessly into the larger narrative framework of the third story of the Maḥbarot Immanuel. 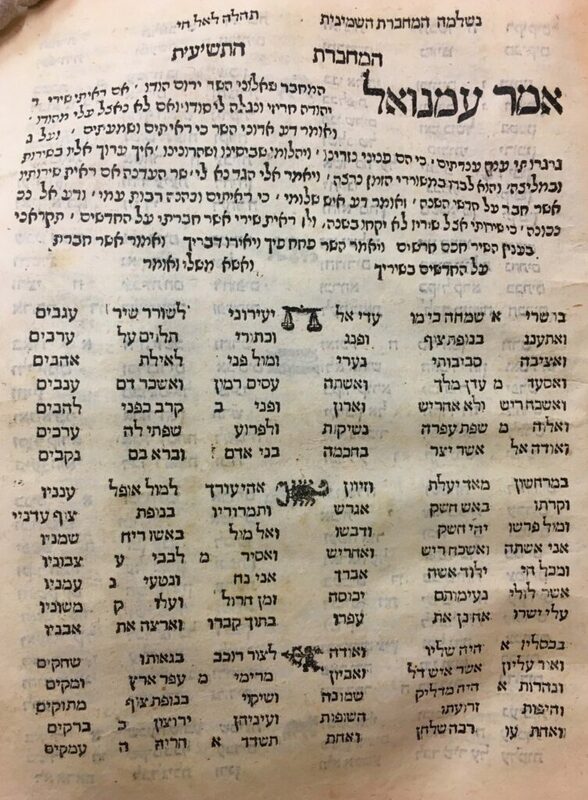 Because Immanuel is the only Jewish poet of this era with extant Italian lyrics, it is difficult to gauge how aware Immanuel’s Hebrew readers were of his innovative use of Italian forms in the Maḥbarot Immanuel. Regardless, the Maḥbarot Immanuel was a tremendously popular work that spread rapidly with the invention of the printing press. Indeed, it became famous enough to be banned in the sixteenth-century Code of Jewish Law (Shulḥan ʿArukh, literally Prepared Table) for reading on the Sabbath, due to its licentious contents (Shulḥan ʿArukh ʿOraḥ Ḥayim 307.16). Immanuel wrote five poems in Italian—four sonnets and one frottola. 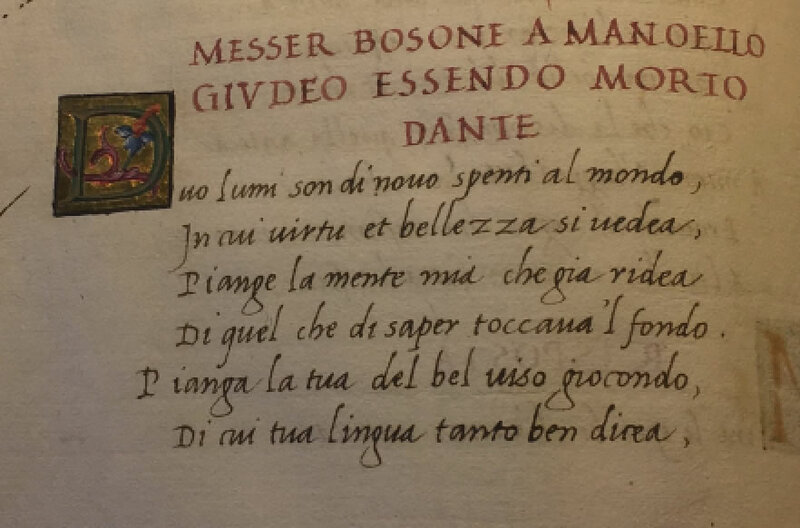 Three of the sonnets are standalone and the fourth is part of a tenzone with Bosone da Gubbio to eulogize Dante’s death. Few scholars have commented on these sonnets with respect to Italian poetics and Immanuel’s Jewish identity; exceptions are Fabian Alfie (“Immanuel of Rome, Alias Manoello Giudeo: The Poetics of Jewish Identity in Fourteenth-Century Italy,”) and Wout van Bekkum (“The Emperor of Poets”). In addition to these lyrics, there is a tenzone of dubious attribution, purportedly between Cino da Pistoia and Bosone da Gubbio, on the occasion of Immanuel’s death. Questions of attribution aside, the fact that two Christian Italian poets exchanged sonnets upon Immanuel’s death suggests that Immanuel was known well enough to be eulogized. In this case, however, the poets, especially the one claiming to be Cino, take the exchange as an opportunity to assess where Immanuel and Dante now reside in the afterlife. It is not a positive exchange, but it is recognition, nonetheless. Though gleaning personality from fictional writing is generally unproductive, it seems likely that Immanuel would have reveled in any attention, regardless of tone. The Italian is from Marti’s edition of Poeti giocosi del tempo di Dante (Milano: Rizzoli, 1956); translations are my own. e non sa mai che misura si sia. e sempre retra sé per ogni via. né per téma digiunt’è, per ch’ i’ giostri. Love never held to laws or faith. Love never knows measure or limit. while always becoming more distant. ceding neither to 'Our Fathers' nor to incantations. Nor will it uncleave, though in fear I struggle. Though an explication of this sonnet could span many pages, I limit myself to two comments that are particularly relevant in the context of Digital Dante. First, on the use of the liturgical terms ‘avemaria’ and ‘paternostri’: Immanuel could have chosen words or phrases without Christological significance to convey similar meanings. As is, Immanuel lets his reader know that he is familiar enough with Christian customs and vocabulary to incorporate them into his parodic sonnet. Second, the repetition of ‘Amor’ in the opening of the sonnet recalls the repetition of Amor in Francesca’s answer to Dante in Inferno 5: Amor, ch’al cor gentil ratto s’apprende,/ Amor, ch’a nullo amato amar perdona,/ Amor condusse noi ad una morte (Inf. 5.100, 103, 106; Petrocchi edition). Not wanting to be outdone by a Trinitarian-tinged reference to love, Immanuel continues the repetition of Amor in the first verses of the remaining stanzas. That Paolo and Francesca fell in love while reading adds further meaning to Immanuel’s opening verse of Love never reading the Hail Mary. e piaceme se l’uno e l’altro ha loda. ver’ li cristiani non drizzo la proda. che non tèn fé de la cintura in gioso. I don’t know who I am! Everyone listen! My very being is a Ghibelline. I’m happy when they’re praised. And in Tuscany, may the Guelfs win. In Romagna I am what Zappettino is. and I don’t want to follow the Christians. since from the belt down, that one doesn’t follow any faith. *Marti’s edition reads “In steso non mi conosco,” but the Vat. Barb. Lat. 3953 reads “eu,” or io, which seems to make more sense here. Here I rely on Debenedetti, who in 1904 referred to the Vat. Lat. Barb. 3953, proposing “ensteso” as a modification of “eu stesso” (“I sonetti volgari di Immanuele Romano,” p. 11). Here, Immanuel moves deftly from the political to the theological: he informs the reader that he is just as adept at deciphering the political factions and key families of fractured Italy as he is at distilling his favorite qualities of the three monotheistic faiths into stereotypes. In formulating his poem in this manner, Immanuel himself seems to be playing into the stereotype that his Christian readers likely want to hear, i.e., that he is gluttonous, lustful, and generally lazy. He is a bad Jew, as he flippantly announces. Underlying this parade of conventions is, of course, the fact that Immanuel is the poet; he is in a position of power. che ferirò da coda e starò franco. e aitar ciascun che vince, infin a morte. each one wants me to surrender to him whole. but only declare the one who pleases me most. Long live the winner, and I will be on <em>that</em> side! I will stay in the background and remain free. and until my dying day, I’ll help the winner. *Trivican(o) is a term for a deity that medieval Christians associated with Muslims. Moving in the opposite trajectory of the previous sonnet Immanuel begins this sonnet with the theological and then works towards the political (Debenedetti, p. 12). Yet unlike the conspicuous name-dropping in the previous sonnet, here he does not seem to be as concerned with his readers’ expectations of his knowledge of Italian politics. In fact, he names them to undermine their importance: he treats the religious and the political with equal irreverence, admitting his willingness to side with the most profitable group. There are a couple of factors that set Immanuel’s sonnet apart from a typical political parody. First, Immanuel writes as if he were an insider, knowledgeable about each group he mentions, when in reality, he was an outsider: Judaism was never a consequential competitor with respect to Christianity and Islam, and Jews were irrelevant in the forum of local politics. Second, Immanuel is willing to risk identifying himself as disloyal, even in the relatively low-risk context of parodic lyric. In pre-ghetto Italy and despite certain official rulings (such as the 1321 papal edict), Immanuel had the relative freedom to travel and converse with others, as long as he possessed the resources that such a lifestyle required. Even so, his seemingly independent existence does not translate to legitimacy among fellow poets and/or politically active compatriots. For these reasons, this sonnet strikes me as particularly precarious despite its intentional parody, though perhaps Immanuel’s contemporaries found humor rather than incriminating evidence in its outsider pessimism. Personal research photograph of Biblioteca Casanatense Ms. 433, Raccolta di rime di autori italiani del Duecento. 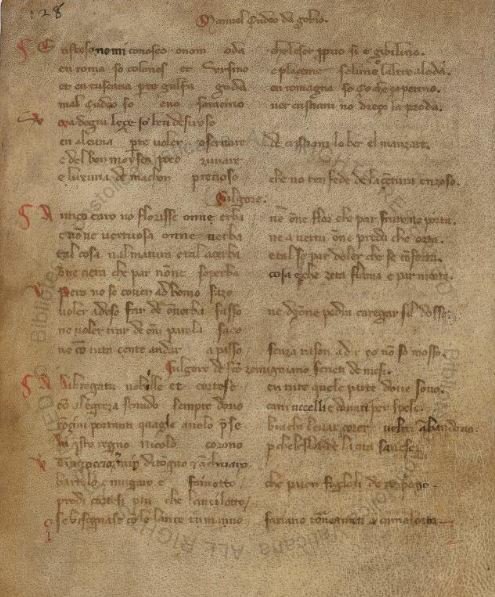 Several parts of this manuscript have been digitized by the Biblioteca Casanatense but the tenzone between Bosone and Immanuel has not. di quel che di saper toccava il fondo. ogni omo che sta dentro a questo tondo. ché sotto 'l sol non fu mai peggior anno. Dante abbia posto ’n glorïoso scanno. for one whose knowledge plumbed the depths. of whom your tongue used to speak so well. lives upon this globe should weep. for under the sun was never a worse year. has placed Dante in a glorious seat in Paradise. se non fosser le lagrime in che abbondo. al percoter sto forte e non affondo. pianto perpetüal m’è fatto reo. per invidia del ben fece quell danno. if it weren’t for the tears that I abound in. I stand firm to the blows and do not drown. this catastrophe has cost me in perpetual tears. jealous of human goodness, brought about this loss. Before moving to the sonnets, I’ll offer a brief comment on the legacy of this poetic exchange: this tenzone has prompted many scholars to make the not impossible yet entirely unfounded claim that Immanuel shared a close friendship with Dante. Without evidence, this speculation is unproductive and even distracts from the fact that Immanuel was in communication with Bosone, a minor poet and politician. Though Immanuel’s whereabouts remain unclear, the manuscript tradition situates him in Gubbio (“Manuel Giudeo da Gobbio” in the Vat. Lat. Barb. 3953, index of poets). These facts—the tenzone and Immanuel’s affiliation with Gubbio—attest to Immanuel’s rapport with at least one Italian Christian poet. Bosone and Immanuel take decidedly different approaches to lamenting the same deaths. As a way of explaining “duo lumi,” scholars have proposed that Immanuel could have suffered the loss of his wife (or another loved one) alongside the loss of Dante. Perhaps the additional personal loss Immanuel suffered explains his overwhelmingly pessimistic tone in response to Bosone’s relatively accepting stance, or perhaps his pessimism was an innate personal quality, here merely fueled by death. 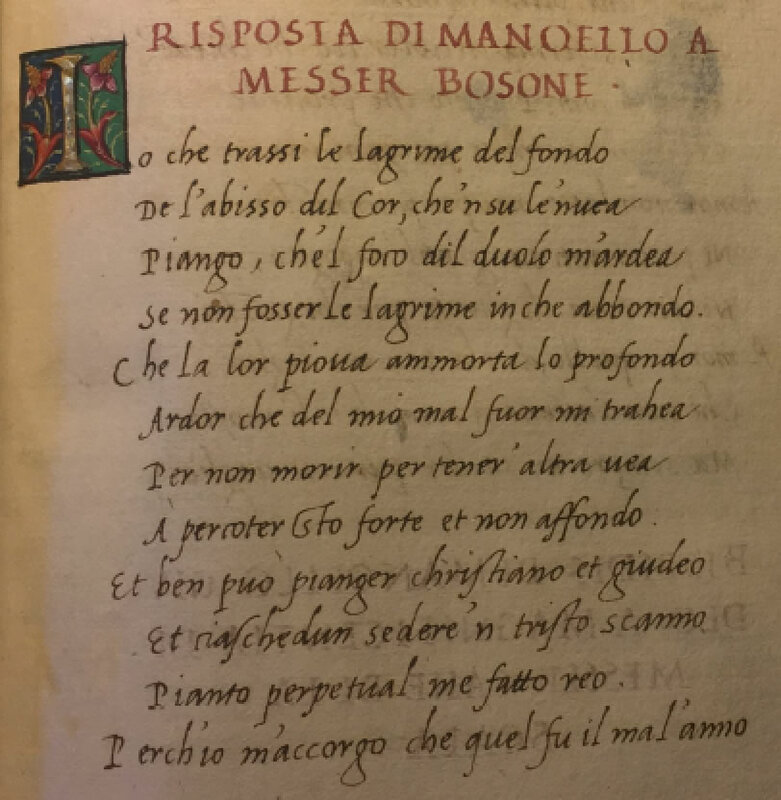 Bosone’s address to Immanuel follows the expected path of an elegy, moving from mournful to hopeful: at first, Bosone miserably perceives the world’s loss of Dante’s wisdom, but by the end of the sonnet, he has found solace in imagining that God has granted Dante a “glorioso scanno” in heaven. Yet Bosone’s lamentation is not entirely orthodox: he remarkably highlights Immanuel’s personal state of mourning. He draws attention to the bereft Manoel Giudeo, who is left as a solitary, grieving figure. In essence, Bosone gives Immanuel permission to mourn Dante’s death, and in so doing, simultaneously acknowledges Immanuel’s humanness and invites his poetic response. Immanuel seizes Bosone’s invitation, depicting himself as the grieving “Manoel Giudeo” of Bosone’s sonnet, but he quickly veers from the path of Bosone’s mourning to reaffirm his right to lament Dante’s death: “E ben può pianger cristiano e giudeo.” Immanuel momentarily puts aside his personal woe to highlight shared grief across religious boundaries; as a Jew, Immanuel has experienced the loss of Dante as profoundly as any Christian has. Immanuel’s notion of mourning as an equalizer across faiths justifies his poetic voice, giving him the right to respond to Bosone as a fellow mourner. Yet this glimmer of inclusion gives way to deprivation, once again, as Immanuel identifies God as the source of this suffering: “Deo/ per invidia del ben fece quel danno.” Though God’s jealousy of a beloved was a lyric convention by this time, God’s jealousy of a recently deceased non-beloved is unexpected. What Bosone imagines as Dante’s “glorioso scanno” becomes a “tristo scanno” (Vitale, p. 550, n. 10) in Immanuel’s despairing, ultimately lonely, response. con caro mercato-per terra e per mare. e di Romania-gran parte, mi pare. e sì del Gran Cano-poria novellare. per quel che si suona - del dire e del fare. giach giach giach,-quando gli odi andare. qui son le tempeste-d’amore e d’amare. le vedove sciuvi vu;-ti possa annegare! a menar le tresche,-trottare ed ambiare. e l’altra: “Sta qui,-ch’io vo per tornare”. ch’Amor è ’n la sala-del Sir de la Scala. ma pur mi parea-in gran mare stare. a guisa di trombe,-chi ’n pian vòl sonare. voci alt’ed agute,-qui s’odon cantare. stututù ifiù ifiù ifiù-tamburar, zuffolare. che par cosa nova-a vederli golare. li levrieri guuu uu-per volersi sfugare. ragazzi e corrieri,-ciascun per sé andare. e quanto e quanto-li vedi spazzare. su la sala li balli,-insieme operare. che quel tien più caro-che me’ ne sa fare. che quel cotai pazzi-non vidi muffare. e visi con strazze-e occhi ambugliare. ed animai novi-quant’uom pò contare. ché largo costume-li fa governare. ch’el brodo col rame-si vòl trangugiare. che l’aere la sera-si crede abbruciare. con brandon di fochi–vedut’ho giostrare. che paiono alani-di Spagna abbaiare. E di un riso: che c’è?-che c’è? che c’è? heee heee heee heee; ogni uom vuol crepare. che tra li beati-sen può ragionare. che ’l suo grande onore-va per terra e mare. by land and by sea- with little reward. and Romania, a large part of it, it seems to me. renowned for its words and deeds. switching their steeds and flags, coats of arms and weaponry. pedach giach giach giach…as you hear them go by. duduf, duduf - the flapping of flags. here come the storms of bitter love and of loving! and the widows sciuvi vu - their chatter drowns out everything else! Feverishly skipping - trotting and walking along. my dear lady causes virtue to reign. but indeed it seemed to me to be in a great sea. noble and courtly: see them arrive here. like a drum, that slowly builds momentum. loud, shrill voices - here you hear them sing. stututu ifiu ifiu ifiu - drumming, whistling. and here troubadours - hear how they complement each other. Intarlatin - playing and dancing. the greyhounds guuu uu - to make an escape. Boys and messengers, each one goes his own way. Bisbisbidis - you’ll hear her advise. Jews and Muslims, see how they all arrive. tatim tatim - hear the drumming! balauf balauf - you hear it trill here and there. in the room they dance, moving together. dududu dududu - reverberating around you. see across the stairs how they steal the precious plates. what he holds most dear, he knows best what to do. you won't see such crazy youths growing mold anytime soon. some with black eyes, some bruises. Gegegì, gegegì - the birds twitter in springtime. and strange exotic beasts - more than one can count. and enormous rams - I saw them butting heads. bobobottombo bobobottombo - the trumpets sound. the generosity [of Cangrande] keeps them going. they would gulp down the copper bowl with the broth. that they seem to burn the evening air. tatam tatam - lutes twitter along. with huge firebrands I’ve seen them joust. that they seem to be huge guard-dogs, barking from Spain. beating each other up, gnashing their teeth. And a laugh. What is it? What happened? What is it? heee heee heee heee - each man howls with laughter. their beauty is a topic for the blessed in paradise. That his great honor spreads by land and by sea. Though scholars have admired the onomatopoeic inventiveness of this early frottola, none have devoted significant attention to its contents. In a forthcoming article, I address this more thoroughly but will offer two comments here. First, it seems more than mere coincidence that Immanuel would be drawn to the figure of Cangrande della Scala, given that Cangrande was Dante’s patron. As in portions of the Maḥbarot Immanuel, Immanuel is intent on comparing himself to Dante (see above analysis). Second, while he offers detailed depictions of Verona, Immanuel himself is nearly absent as a character in the narrative, a sharp contrast to the utter vibrancy of the bodies and actions he depicts. I see this as yet another sign of Immanuel’s status as astute outside observer, never truly a part of an Italian poetic circle. The lack of evidence of Italian lyrics composed by other Jews in this period might also account for the frottola’s sense of loneliness; indeed, it seems that just as Immanuel was an outsider among Italian poets, he was likewise a loner among Italian Jews of his generation, very few of whom would have been able to understand and appreciate his bold experiments in vernacular lyric. Even if the personal link between Dante and Immanuel remains highly unlikely, Immanuel’s Hebrew and Italian lyrics reflect one way in which Dantean poetics shaped an ‘other’ of thirteenth- and fourteenth-century Italy. Though Immanuel gained greater renown in Hebrew than in Italian, his compositions in both languages attest to his adroit awareness of Italian lyric forms and motifs. Immanuel’s blending of genres, forms, and languages offers Dante’s readers an alternate glimpse into the poetics of medieval Italy. *Special thanks to Teodolinda Barolini for editing my English translations of Immanuel’s Italian poems; to Michelle Chesner, Norman E. Alexander Librarian for Jewish Studies at the Columbia University Libraries, for her assistance in locating early printed editions of Immanuel’s texts and for granting my permission to reproduce images of those editions on Digital Dante; and to Dr. Raymond P. Scheindlin and Dr. Dana Fishkin.